For over 40 years, one brand has gone above and beyond when its comes to developing their products for their devout customers. At the forefront of technological advancement, Oakley have consistently raise the bar in the field of eye wear. As a leading manufacturer for active lifestyle frames, Oakley ensure their products are unparalleled by any competitor. The Oakley Prizm Dark Golf Lenses is another step forward for Oakley, and it’s loyal supporters. While catering to an array of sports, Oakley have tailored a lens strictly for golfers who enjoy life on the course. Oakley now offer a lens, purpose built, which offers the same patented features as the original Prizm Golf lens, with a darker lens, which allows you to optimise your performance when the sun decides to come out. On top of that, Oakley Prizm Dark Golf Lenses highlight the finer details with precision. They enhance visual contrast, while the colour of the lens have a understated aesthetic for those who prefer a more casual attire during a round of golf. Golfers face a number of challenges while out on the course, tracking the ball, reading the course, and finding your ball in the rough, just to name a few. 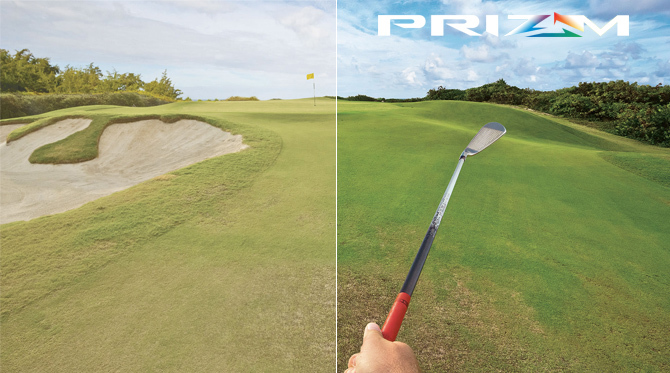 The Prizm Dark Golf lenses gives you an incredible advantage while in the thick of it. Reading the surface you’re playing into just because a whole lot easier. The Prizm Dark Gold lenses allows you to read the condition of the grass, and texture of the ground, allowing you to transition between fairway, fringe, and rough with relative ease. To get the absolute most out of your day on the course, Oakley have added the Prizm Dark Golf to a number of frames. For wrap around sporting frames, look no further than the Half Jacket 2.0 XL, Flak Jacket 2.0 XL, and visor lens frame Radar EV Path. The lifestyle frames include the Mainlink, the Sliver, and the recent classic Holbrook.